The Somerville Arts Council and Boston Handmade present an ArtsUnion Event: The Boston Handmade Marketplace for the 4th year running, in Union Square, Somerville (at the intersection of Washington, Prospect & Somerville Ave.) THIS SATURDAY, July 30, 2011, 3-7pm (rain date Sunday, July 31). 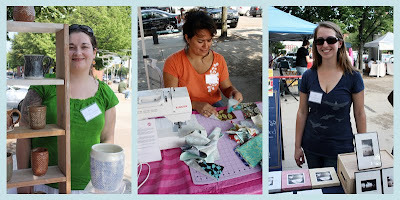 The Boston Handmade Marketplace is an outdoor art and craft exhibition featuring work by New England artists and members of the nonprofit arts organization Boston Handmade. This event promotes local independent businesses and individuals creating one-of-a-kind and limited edition handmade works in small studio environments. More than 25 locally grown artists, artisans, and craftspeople will be showing and selling handmade jewelry, ceramics, textiles, handspun yarn, paper goods, hand blown glass, and more. In addition to the individual exhibitors at the 2011 Boston Handmade Marketplace there will be live performances by local musicians, One Happy Island, and the Weisstronauts, along with craft demonstrations throughout the day featuring the Common Cod Fiber Guild, Creative Union, and Stitch House Dorchester. We are so grateful to all our sponsors for supporting The 2011 Boston Handmade Marketplace: the Somerville Arts Council, the Massachusetts Cultural Council, Etsy.com, and our Exclusive Media Sponsor, GateHouse Media New England. Visit our website to see a full list of exhibitors and for directions to the event: www.bostonhandmade.org. We look forward to seeing you there!